Keeping babies happy at mealtimes can sometimes feel like a Herculean task — they are, after all, our most brutally honest food critics — so it’s important to have the right tools at hand to keep things running smoothly. You have the high chair, the baby food, and the patience of a saint, but what about a bib? From keeping that lovely little outfit stain-free (at least long enough for Grandma to see them in it) to guarding against uncomfortable wet patches next to their skin, there’s a lot a good bib can do. First of all, it’s widely known that for such tiny humans, babies can produce a surprising amount of icky stuff. We won’t go into detail here, but anyone who’s had the good fortune to spend a lot of time around them knows it to be true. Therefore, it might be a good idea to go for a bib that’s comfortable to wear throughout the day, not just at mealtimes, if your mini-me is a master dribbler. Look for soft-on-skin neckbands, cotton or neoprene construction, and good thickness to keep their clothes dry and troublesome rashes at bay. Secondly, size is an important consideration: all that adorable baby pudge can often manifest itself in multiple chins, so go for something that will cover their clothes but not sit too tightly around the neck and be uncomfortable. Bibs with adjustable necks are perfect for this, and have the added bonus of growing with them. Then there’s the best value bib, the best bib for teething, the best for packing light and the best for play... put simply, no matter your little one’s particular set of needs, we’re sure to have found something that’ll step up to the challenge. The neoprene material of this all-round winning bib, immediately recognisable to anyone who’s worn a wetsuit, makes it waterproof, machine washable and tumble dryer safe, meaning it’s capable of handling punishment from even the most determined babies. Its soft fabric, which comes in a number of cute and colourful designs, means no discomfort, and the well-designed scoop pocket at the end catches all manner of debris. All in all, the best bib for everyday. The Eat & Play Smock does exactly what it says on the tin: perfect for messy play and messy eaters alike. Its full-body design covers clothes completely, and its soft and breathable fabric is liquid-proof, providing an admirable line of defence against food, paint, and all manner of other messes. Its construction and soft-on-skin elastic openings make it comfy to wear, but the all-over design might feel overwhelming for very little ones at first. The second Baby Bjorn offering in our top three boasts an equal, but very different set of charms to its forerunner. 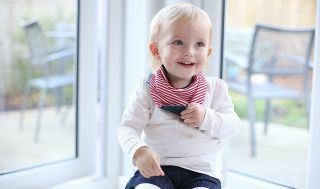 It’s a great all-round eating bib, with a variety of cheerful colours to choose from and, most importantly, a super adjustable neckband. The soft beaded ring has an adaptable fastening (for when you can’t believe how fast they’re growing) and the bottom of the bib ends in a handy scoop (for when they “accidentally” miss). This two-in-one bib easily folds down for minimum fuss on holiday or on the go. It’s ideal for throwing in a changing bag for eating out, or a suitcase for trips away, especially when cutlery can be stored inside the crumb catcher for simple transportation. The soft cotton bib is machine washable, and while it’s unfortunately not adjustable, the side velcro opening — like the handy crumb-catching scoop — is suited to one-handed clean-up after messy mealtimes. Our little ones have a lot of requirements, and ticking off the seemingly endless list of buys for baby can prove expensive. So it’s especially comforting to know that bibs like Tommee Tippee’s Comfi Neck Catch All exist, offering excellent comfort and performance for a small price. It does the job superbly, offering durable and low-maintenance support (it’s tough and dishwasher-safe) while surprising us with premium features like a soft-lined neck for sensitive skin. These sweet bandana-style bibs are as strong on substance as they are on style. Perfect for active dribblers, the organic cotton construction is not only soft on baby’s skin, but is thick and sturdy enough to prevent dribble soaking through to their clothes, reducing the risk of rashes and discomfort. Great for teething, reflux, or weaning. However, the interior contains some polyester, and may not be suitable for very sensitive or eczema-prone skin. Put simply, this is the ultimate teething bib. The nautical look of the soft and comfy Neckerchew itself is adorable — although there are plenty of other cute designs available, if your baby’s more of a dino devotee or farmyard fan — and it’s machine washable even with the clever teething add-on. The attachment is made of safety tested plastic, so they can chomp on it to their little heart’s content, and catches rogue dribble at the same time. Win-win.